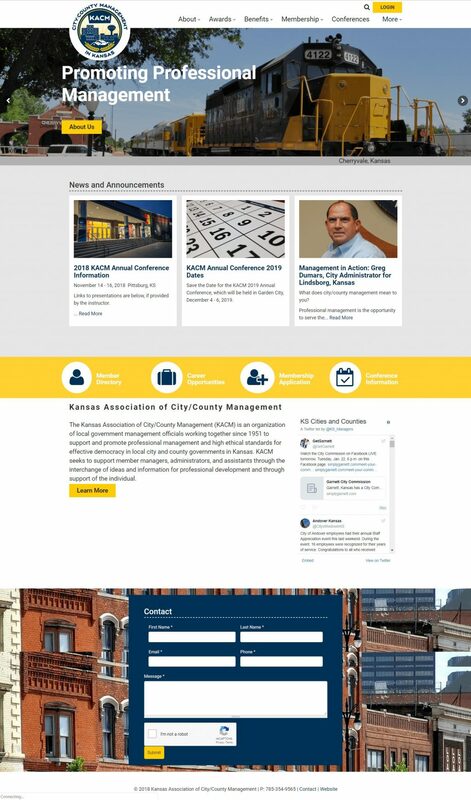 Since Webcom Resources is particularly passionate about supporting the digital presence of cities and communities across the Midwest, we were excited about the opportunity to redesign the Kansas Association of CIty/County Manager’s website. We submitted a proposal for the project and were honored to have been chosen among several other bids. Because of the member requirements of the project, we used Drupal 7 for the website content management system. Drupal is one of the most-used website solutions for government usage as it is highly secure and extremely extensible. KACM’s goal for the updated website was to increase its usefulness as a member resource. The custom member database and tools for the members were the key focus. Members can share files with other members and use a message center that provides forum-style communication options between members. Members can add themselves to a committee through their member page. The site features images from the most recent Kansas city photo contest. Twitter feed of the accounts of cities across Kansas. Kansas Association of City/County Management (KACM) is an organization of local government management officials focused on supporting and promoting professional management and instilling high ethical standards in local governments in Kansas. KACM’s purpose is to provide support for its members through training, networking, and exchanging ideas and information for professional development.